HARRIS-Evelyn Hancock Harris, age 85, of Aiken, S.C., loving wife for over 60 years to Floyd W. Harris and daughter of the late Joe Hancock, Sr. and the late Beatrice Lamb Hancock, went to meet her Lord and Savior at her residence on Thursday morning, January 24, 2019. In addition to her husband, she is survived by brothers, Nish “Snap” (Alice) Hancock and Joe “Noodie” Hancock, Jr.; sisters, Irene H. Baughman and Betty H. Franklin, sister-in-law and brother-in-law, Glenda and Sammie Napier; special nieces who helped care for her during her illness, Debra Logue and Margaret Turner and also special friends who assisted with her care; Barbara Whitworth, Dorothy Condry and Ceal Zoto and many other nieces and nephews. 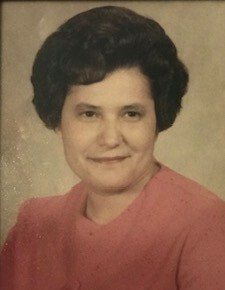 She was born in Vaucluse and was a lifelong resident of Aiken County, S.C. She was a member of the old Vaucluse Church of God, where she taught a Sunday School Class for many years. She currently was a member of University Parkway Church of God in Aiken. She was a dedicated Christian lady, a loving wife and friend. She and her husband loved to have breakfast at McDonald’s every morning with several of their friends. She was just a well-rounded special lady who loved everyone. She retired from the Vaucluse Division of Graniteville Company after many years of service. She shall be greatly missed by her family and many friends. Death is not the end for her as she has just made that great transition to her new Heavenly home where all is joy and peace and no more pain nor sorrow in a land of endless tomorrows. Yes, another angel for God’s great choir. A service, celebrating her life and homegoing, will be held in the Chapel of Napier Funeral Home on Sunday, January 27, 2019 at 3:00 PM with Rev. Edward Hardee, Rev. Derrick Cutter and Rev. Henry Shaffer officiating. The interment will follow at the Vaucluse Cemetery in Vaucluse, S.C. The Pallbearers will be Donnie Waters, Brian Kneece, Doug Rains, Donnie Turner, Clyde Condry and Eddie Renew. Members of her Sunday School Class will serve as Honorary Pallbearers. Memorials, in her honor, may be made to SPCA Albrecht Center, 199 Willow Run Rd., Aiken, S. C. 2980l. The family will receive friends at the funeral home the day of the service from 1:00 PM until the hour of service. Napier Funeral Home, 315 Main St., Graniteville, S.C. 29829 is in charge of the arrangements. You may sign our guest register by logging on to www.napierfuneralhomeinc.com.